The rules presented below are used in Europe at big international competitions. Thus, the results achieved by the individual sport throwers can be compared more easily. For a history of how these rules came about, see the end of this page. The target is a circle measuring 50cm in diameter; it is partitioned into 5 concentric rings with the following diameters (and colours): 10cm (black), 20cm (white), 30cm (red), 40cm (white), 50cm (red). Points: the centre (bullseye) earns 5 points, 4/3/2/1 points are awarded for the respective outer rings. Heights of the targets (measured from the bullseye to the ground): 1.30m up to 1.60m. Knives 3m, Knives 5m and Knives 7m. Axes 4m and Axes 7m. Distances given for these events are minimum distances. You must not stand closer to the target, but can move a maximum of 2m back (both for knives and axes). You have 21 throws per event. For each target you are allowed one test throw, which has to be declared as such in advance. In case of bad weather, narrow time constraints or other emergency situations, the organiser can decide to hold only 15 throws instead of 21. The points are summed up per event. Additionally, for informative purposes the fraction of the achieved points divided by the maximum number of points achievable in this event will be given in percent. Same rules for knives and axes. Whether a throw is valid is decided analogously to the counting rules. The target is a circle with a diameter of 1m. The goal is to achieve a stick in this circle from the farthest distance. Only knives with a rigid blade, longer than 23cm and with a blade narrower than 6cm. Minimum weight 500g, maximum breadth of the blade 12cm. After each evaluation, the arbiter retrieves the throwing tools and brings them back to the thrower. The thrower can request that, before another throw at a target, the throwing tool sticking there be evaluated and removed. The tool will be counted exactly as it is sticking in the target, it will not be redressed perpendicular to the target. For a throw to be valid, a knife's tip and an axe's blade must stick. With double-bladed axes, only sticks with the handle down are valid. If both blades touch the target, the throw is invalid. Distances are measured from the tip of the foot that was closest to the target during the throw. It is thus forbidden to transgress the minimum distance lines, doing so will make the throw invalid (0 points). If more than 5 women participate, there will be a separate ranking for them. Throwers from all countries can participate in the contest. The nationality plays no role whatsoever in determining the rankings and winners. For the national championship only, organisers have the option to solely allow participants from their country; In this case, the exclusion of foreigners must be clearly communicated when advertising the event and inviting to it (even in-country). A first-aid kit must be available on site. Throwing at the competition targets is only allowed under the supervision of an arbiter. Throwing at the training targets is only allowed if an official range officer is present. The range officer observes the throwing and intervenes before dangerous situations arise. The rectangular area 10m in front of and 3m to both sides of the targets is roped off, only contestants and arbiters are allowed here. It is forbidden to stay behind the targets. There is a minimum distance of 6m between the targets. Participants under 18 years must be accompanied by a parent or legal guardian. The main referee is always right. If you do not observe the rules, especially those meant for security, you will be disqualified and sent off the place. Every participant has to have a third party liability insurance, if this insurance is offered as standard option by insurers in the thrower's home country. These rules are called „European Knife and Axe Throwing Rules“. The official rule document is in English language, translations are provided for convenience only. A target construction normally consists of 3 separate targets, which will be thrown at clockwise. The best material for targets is end grain wood, for example the slice of a tree. In many European nations, there are competitions in axe throwing and knife throwing, albeit with different rules. Thus, on the 20th of September 2008 in Chomutov/Czech Republic, on the occasion of the eighth Big European Throwers Meeting, official representatives of the sport from 4 countries sat together to discuss common rules. After three hous of negotiations in 4 languages, we found a consensus, the so-called Chomutov-Agreement. 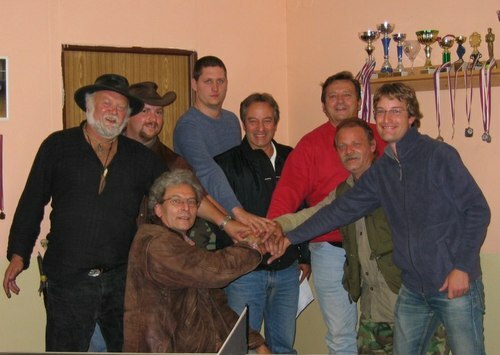 In 2009, after experiences at the Big European Throwers Meeting in Villeflambeau, it became clear that some rules were formulated unclear, or were not supported equally by all throwers.Thus, the EuroThrowers started a consultation process with associations in Germany, France, Italy and the Czech Repbulic, with a voting at the end. The resulting 2010 version will remain stable for at least three years. Of course, those rules may be and are encouraged to be used in countries that have not yet officially joined the EuroThrowers!